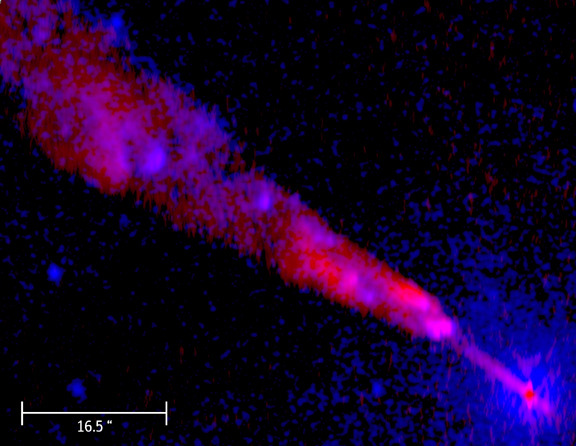 This is a composite image of Chandra X-ray (blue) and VLA radio (red) observations showing the inner 4,000 light years of a magnetized jet in Centaurus A. Purple regions are bright in both radio and X-ray. The jet originates from the vicinity of the supermassive black hole at the center of the galaxy (lower right hand corner of the image). The radio observations, taken between 1991 and 2002, showed that the inner portion of the jet is moving away from the center of the galaxy at speeds of about half the speed of light. Most of the X-rays from the jet are produced farther out where the jet stalls as it plows through the gas in the galaxy. The collision of the jet with the galactic gas generates a powerful shock wave that produces the extremely high-energy particles responsible for the X-rays. Because Centaurus A Jet is relatively nearby at a distance of 11 million light years, this image offers one of the most detailed looks yet at the interaction of a jet with gas in its galaxy. Jets such as the one in Centaurus A Jet are widespread phenomena in the cosmos, and represent one of the primary means for extracting energy from the vicinity of a black hole. Some jets extend over distances of a million light years. They represent a major energy source for the galaxy and are thought to affect the evolution of the host galaxy and its surroundings. The Centaurus A Jet image will help scientists to understand the effects of jets on their environment. Coordinates (J2000) RA 13h 25m 28.69s | Dec -43° 00´ 59.70"